We began breeding on September 1, 2018. Will breed about 45 registered Suffolk Ewes and Suffolk/Hampshire cross-bred Ewes — that began lambing in early February, 2019. 4-H’ers will have a very good selection of 2019 4-H Market Lambs. 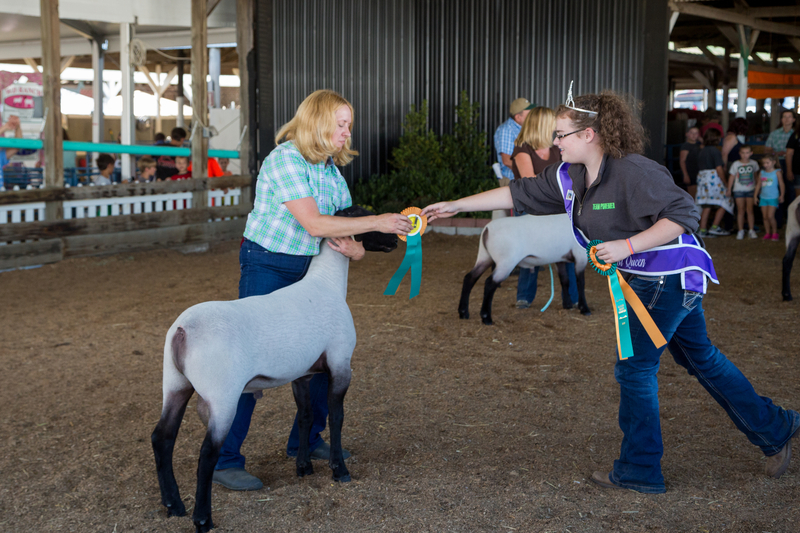 2015 Suffolk Ram Breed Show – Kelly receiving the Champion ribbon for Vorac Ram Lamb 1538 RR/NN. 1538 won the late junior ram lamb class — then won the Champion Suffolk Breed Show. Ram 1538 is one of the stud rams that we currently use. Our brood ewes are heavily influenced by Tom Slack (Indiana), Bill MacCauley (Pennsylvania), Ellerbrock (Illinois), Bob Kimm (Iowa), and Miller (Texas) Hampshire genetics. 90% to 95% of the 2018-2019 lamb crop will be RR/NN lambs. We keep extensive breeding records and individual ewe lambing records. We’ll also breed about 10-16 ewes each year for other shepherds, who have small flocks. If you want your ewes bred — you can choose from any of the rams we have — if there is room in the ram’s breeding group. Ewe Breeding Service information is on the “How to Purchase” tab. We’ll be using these 4 Stud rams in 2018 as Sires for our 2019 lambs — and for the ewes we breed for other people. 2. 2014 Vorac Ram 1446 RR/NN. A very thick, solid 2014 ram lamb, with the best growth, loin, length and thickness of all our 2014 ram lambs. At 5 months old, Ram 1446 weighed 192 lbs. As a late junior ram lamb — 1446 was the Reserve Champion Suffolk Ram at the 2014 Great Frederick Fair. Sire: MacCauley 2392 RR “Crossfire”. Dam: Vorac 1003 RR/NN, with some Bob Kimm (Iowa) and Tom Slack (Indiana) genetics. As a yearling, Ram 1446 was shown at the Great Frederick Fair in September, 2015. He was beat out by our Vorac Ram Lamb 1538 RR/NN. Sold: 2015 Vorac Ram 1538 RR/NN. Our best 2015 ram lamb — Champion Suffolk Ram (as a ram lamb) at The Great Frederick Fair in September, 2015 — Reserve Champion Suffolk Ram in 2016 as a yearling. In 2015 Ram 1538 was leased to a producer in Maryland to see how his 2016 lamb crop develops. Twin ram lamb 1537 RR/NN was sold to a Suffolk producer in Garrett County, MD. We began using 1538 for the first time in fall of 2016 for 2017 lambs. 3. 2016 MacCauley Ram 3645 RR/NN. His sire is MacCauley’s 3068 — the first place Yearling Suffolk Ram and Reserve Champion Slick-Sheared Suffolk Ram at the 2015 NAILE in Louisville, KY. (NAILE: North American International Livestock Exposition). Our MacCauley Ram 3645, as an Early Jr. Ram Lamb, was the Champion Suffolk Ram in the Suffolk Breed Show, at the 2016 Great Frederick Fair. This means that our MacCauley Ram 3645 beat all other Suffolk Rams (Yearling Rams, Fall Ram Lambs, Early Junior Ram Lambs, and Late Junior Ram Lambs) shown at the 2016 Great Frederick Fair. In 2019 a new Suffolk Ram will be purchased and added to our flock. All our breeding ewes are registered, a few are percentage ewes (crossbred Suffolk/Hampshire ewes), and are registered with Percentage Papers. Most of our breeding ewes have Codon tested as RR, a few are QR. We have no QQ sheep, they were eliminated 17 years ago in 2001. 2017 Ram Lambs taht wre sold. We showed two 2017 ram lambs in 2017 — Ram Lamb 1711 and Ram Lamb 1712 — both out of different sires.
. Sold: Vorac Ram Lamb 1711 RR/NN, single, to a producer in Pennsylvania. Sire: MacCauley 3052 RR. DOB: 2-23-2017.
. Sold: Vorac Ram Lamb 1712 RR/NN, twin, to a large commercial producer in Maryland. Sire: MacCauley, 3645 RR. DOB: 2-24-2017.
. 2018 Ram Lambs have been sold.. Initially selected 8 possible 2018 ram lambs — narrowed down to 2 ram lambs, 1812 and 1854, which were sent to the PA Performance Test in April, 2018. We kept two ram lambs 1856 and 1857 to show in 2018 (ram lambs are out of different dams). Ram Lamb Performance data is on the PA Livestock Evaluation Center website. Click on “Programs” — then click on “Ram Testing Program” — for the bi-weekly reports. Click on “Catalogs” — for the past 2017 Sale catalog — listing the Buck Goat, Rams, plus Ewes and Doe Goats. The two Vorac Suffolk Rams are Lots 112 and 113.